Who are you now and who are you becoming? What aspects of life are you exploring? Exploration of our experience is what brings meaning and wisdom to our lives. Begin an exploration of yourself and never, ever stop. We are never done or complete. Not ever, let go of the idea that by 18, 22, or hell, 45, we have defined ourselves for all time. Accept that changes will happen, sometimes big changes like a life partner, career, or values/priorities. We renew our Spirit as we move through big changes in life. It doesn’t mean we were wrong with our first choice, it just means we have outgrown that one and now need a new one. Explore your ever-growing self. Change is constant and it is better to embrace it, find the silver lining, get good at it. 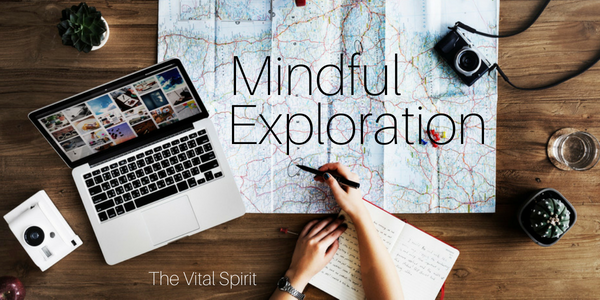 Mindful exploration allows us to take notice of how we are changing, where we are growing, what we are ready to leave behind so that we can take action and expand into our new form. Sometimes the automatic response is to limit ourselves, stay where we are so we don’t upset our family or partner. We hang on to friends or jobs that are not good for us because it is easier to keep things status quo. The Universe will always provide signs for you to notice and opportunities for you to take action on your growth. So continue exploring and keep on becoming. You are a beautiful and miraculous creation that will never be complete. Stay curious and enjoy the ride.